If you arrive in St Remy de Provence taking the winding road through Les Alpilles from Mausanne and Paradou, these splendid Roman ruins are at the gateway to the town. 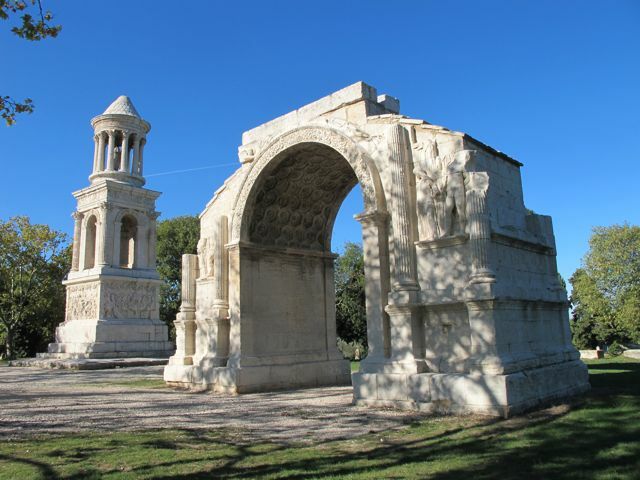 Dating from the 1st century AD, the detailed stone archway and tower next to the road 1km south of St Remy are one of the best relics of Roman civilisation in the south of France. They form part of Glanum, a fortified Roman town which was abandoned in 260 AD. Whilst nowhere as large as the more famous Pompeii, many features such as temples and Roman baths can be explored. We stayed right next to Les Antiques at the appropriately named hotel, Villa Glanum on our first visit to St Remy in 1999. The hotel has a main house with further accommodation in annexed blocks around the swimming pool. My overriding memory is the cleaning ladies with their trolleys and squeaky pumps on the stone floor. We returned there in 2000 and 2001 although on subsequent trips have since upgraded to more upmarket alternatives in the centre of town. Have you been to Les Antiques, St Remy de Provence? Les Alpilles is a splendid region for all sorts of reasons, climate, colours of scenery,food, wine, superb villages.The region is not so well known by UK people but it deserves to be. Love at first sight for me!